UNIVERSITY PARK, Pa. -- One of the brightest gamma-ray explosions ever seen is the focus of five papers being published this week in the journals Science Express and Astrophysical Journal Letters by research teams that include Penn State professor of astronomy and astrophysics David Burrows. Discovered on April 27, this gamma-ray burst, named GRB 130427A, has been the subject of intense study with advanced space observatories including NASA's Swift's X-ray Telescope, for which science and flight operations are controlled by Penn State from the Mission Operations Center at the University Park campus. "The fading light from this monster burst is still detectable by Swift's X-ray Telescope, more than six months after the burst was detected," said Burrows, who is the lead scientist for Swift's X-ray Telescope. "X-ray observations of the afterglow from this burst soon will switch from Swift to NASA's Chandra X-ray Observatory, another X-ray mission with strong Penn State involvement. Chandra should be able to continue to study the afterglow of this explosion for at least another year." Paul Hertz, director of NASA's Astrophysics Division in Washington, D.C., said "We expect to see an event like this only once or twice a century, so we're fortunate it happened when we had the appropriate collection of sensitive space telescopes with complementary capabilities available to see it." Early during the eruption of the burst, a trio of NASA satellites including Swift, working in concert with ground-based robotic telescopes, began capturing never-before-seen details that challenge current theoretical understandings of how gamma-ray bursts work. The Gamma-ray Burst Monitor (GBM) aboard NASA's Fermi Gamma-ray Space Telescope captured the initial wave of gamma rays from GRB 130427A on April 27. NASA's Swift Gamma-ray Burst Mission detected the burst almost simultaneously with the Gamma-ray Burst Montor and quickly relayed its position to ground-based observatories. In its first three seconds alone, the "monster burst" proved brighter than almost any burst previously observed. Telescopes operated by Los Alamos National Laboratory in New Mexico as part of the Rapid Telescopes for Optical Response (RAPTOR) Project then quickly turned to the spot. They detected an optical flash that peaked at magnitude 7 on the astronomical brightness scale, easily visible through binoculars. It is the second-brightest flash ever seen from a gamma-ray burst. Just as the optical flash peaked, Fermi's Large Area Telescope (LAT) detected a spike in GeV gamma-rays reaching 95 GeV, the most energetic light ever seen from a burst. This relationship between a burst's optical light and its high-energy gamma-rays challenges the prevailing theory of how visible light from these bursts is produced. In addition, this extraordinary event enabled NASA's newest X-ray observatory, the Nuclear Spectroscopic Telescope Array (NuSTAR), to make a first-time detection of a burst afterglow in high-energy, or "hard," X-rays after more than a day. "More observations are planned with the Hubble Space Telescope, so that's at least five NASA space observatories involved in studies of this object: Fermi, Swift, NuSTAR, Chandra, and HST," Burrows said. Gamma-ray bursts are the most energetic form of light and the most luminous explosions in the cosmos, thought to be triggered when the core of a massive star runs out of nuclear fuel, collapses under its own weight and forms a black hole. The black hole then drives jets of particles that drill all the way through the collapsing star and erupt into space at nearly the speed of light. Hot matter surrounding a new black hole and internal shock waves produced by collisions within the jet are thought to emit gamma-rays with energies in the million-electron-volt (MeV) range, or roughly 500,000 times the energy of visible light. The most energetic emission, with billion-electron-volt (GeV) gamma rays, is thought to result when the jet slams into its surroundings, forming an external shock wave. 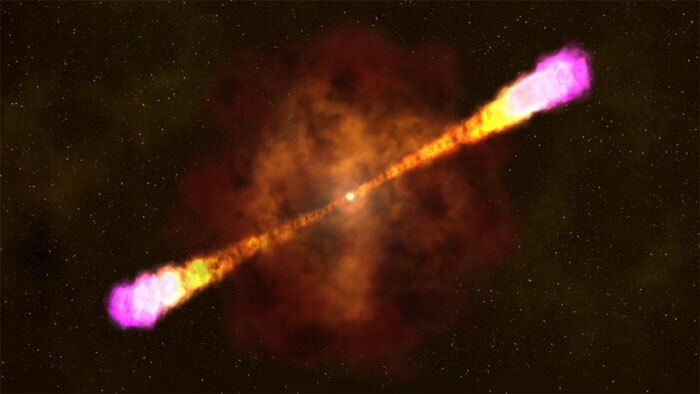 For a gamma-ray burst, this explosion was relatively nearby. Its light traveled 3.8 billion years before arriving at Earth, about one-third the travel time for light from typical bursts. "Detailed observations by Swift and ground-based telescopes clearly show that GRB 130427A has properties more similar to typical distant bursts than to nearby ones," said Gianpiero Tagliaferri, a Swift team member at Brera Observatory in Merate, Italy. Its relative proximity made it a unique laboratory for the study of the acceleration of particles to extremely high energies in astrophysical explosions. nstruments aboard three NASA missions -- including the Swift satellite, which is controlled by Penn State -- and the ground-based RAPTOR telescope provide the most detailed multi-energy look at changing emissions of one of the brightest gamma-ray explosions ever seen. The early pulse of gamma rays from this object, named GRB 130427A, was detected by the Fermi satellite and had behaviors that confounded all models for explaining the emission based on colliding shells of matter. Visible light measured by RAPTOR closely tracks the high-energy gamma rays detected by Fermi, which is an unexpected relationship. Data from Swift's X-ray and ultraviolet-detecting instruments, in concert with measurements from ground telescopes, capture the evolution of the gamma-ray burst over weeks and show that it shares properties with much more distant bursts. Observations by the NuSTAR and Fermi observatories challenge a 12-year-old prediction of how the emission components in a GRB spectrum should change with time. 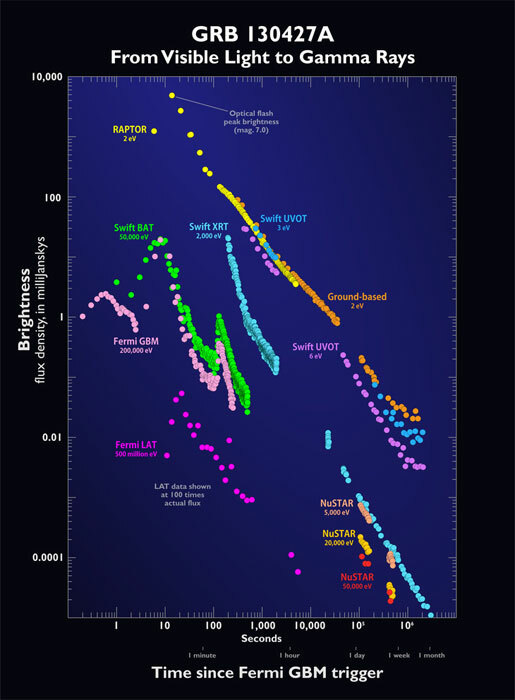 The ground-based measurements shown here come from the Faulkes Telescope North, located at Haleakala Observatory in Hawaii, the Liverpool Telescope on the island of La Palma, Spain, and the MITSuME Telescopes in Japan. For clarity, this chart omits error bars for all measurements. NASA Swift's ultraviolet-detecting telescope (the UVOT) captured the fading light of one of the brightest gamma-ray explosions ever seen, named GRB 130427A, using images acquired through filters that correspond to energies of 4.7 and 6.1 electron volts.